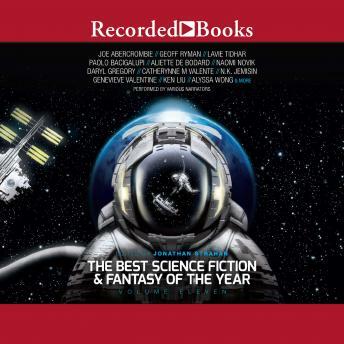 Jonathan Strahan, the award-winning and much lauded editor of many of genre's best known anthologies is back with his 11th volume in this fascinating series, featuring the best science fiction and fantasy. With established names and new talent this diverse and ground-breaking collection will take the reader to the outer-reaches of space and the inner realms of humanity with stories of fantastical worlds and worlds that may still come to pass. FEATURING // CATHERYNNE M. VALENTE // PAOLO BACIGALUPI // ALIETTE DE BODARD // JOE ABERCROMBIE // RICH LARSON // NAOMI NOVIK // ALYSSA WONG // DARYL GREGORY // ALEX IRVINE // SAM J. MILLER // ALICE SOLA KIM // SETH DICKINSON // CAROLYN IVES GILMAN // GENEVIEVE VALENTINE // CAITLIN R. KIERNAN // AMAL EL-MOHTAR // THEODORA GOSS // IAN R. MACLEOD // DELIA SHERMAN // GEOFF RYMAN // NINA ALLAN // N.K. JEMISIN // LAVIE TIDHAR // YOON HA LEE // PAUL MCAULEY // CHARLES YU // E. LILY YU // KEN LIU Author bio: Jonathan Strahan is the multi-award winning editor of such anthologies as Engineering Infinity, Fearsome Magics, The Best of Science Fiction & Fantasy, The Year's Best Australian Science Fiction and Fantasy, and many other ground-breaking collections of the very finest genre fiction.